For more epic quests and apocalyptic scenarios, check out the best RPGs on PC. Extinction is a fantasy action game in which you, as one of the world’s last Sentinels, are the only person capable of fending off an invasion by the Ravenii, a monstrous race bent on the total annihilation of humanity (extinction, in other words). Campaign and side quests:protect humanity across a deep story campaign, rescuing as many civilians as you can while taking down a range of deadly monsters. Side missions with various objectives grant gear upgrades to help you out. Skill-based combat:travel horizontally and vertically, perform wall runs, and use your whip to launch into aerial attacks. Master dynamic combat manoeuvres to scamper across towering enemies and attack their weak points. Progress along different skill trees to develop a build suited to your playstyle. Destructible, interactive environment:move around a fully destructible environment, and use objects in it to your advantage. Each battlefield is unique. Custom battles:create custom battlefields with varied objectives, and challenge other players to compete for the top score. 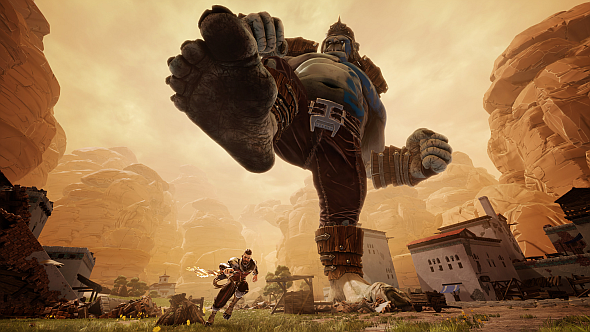 Extinction mode:a horde mode, in which you’ll fend off endless waves of ogres and their minions. Iron Galaxy are a US studio mainly known for ports and technical consulting, but they have made a few small games of their own; if you enjoyed Divekick or Videoball, you’ve enjoyed their previous work. Maximum Games, who helped bring us Troll and I and partnered with Focus Home Interactive on The Technomancer and Farming Simulator 17, are on publishing duties. Extinction is slated for release in the first quarter of next year. We’ll have more after E3. In the meantime, feel free to follow the game’s Twitter.